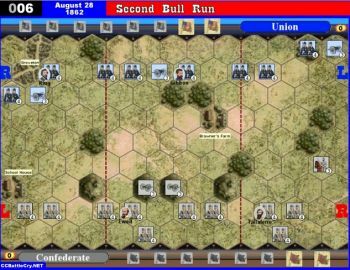 Having gained a victory at Second Bull Run, Lee struck north toward Maryland. This would enable him to keep the initiative, supply his army from the rich farmlands, and keep the campaign out of Confederate territory. McClellan had over 70,000 troops in the farmland around Sharpsburg. They would greatly outnumber Lee’s army of 35,000. McClellan deployed three corps on his right, another was to engage the Confederates on his left, while two others covered the center and formed the reserve. 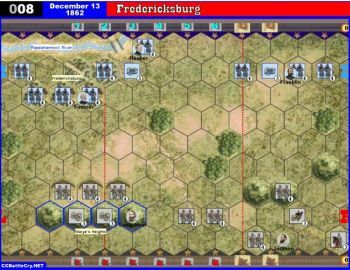 Lee deployed Jackson on his left flank, with Longstreet covering the center and right flank. Lee hoped to be supported by A. P. Hill’s division marching up from Harper’s Ferry. 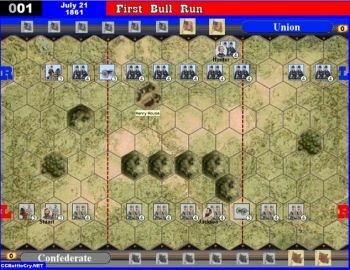 The attacks against the Confederate left flank were poorly coordinated. The fighting in the woods and cornfields around Dunker Church was particularly bloody. Casualties had also been heavy along the line of the sunken road, dubbed “Bloody Lane” by those who fought there. 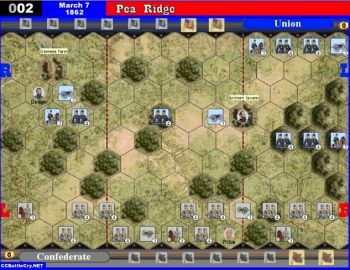 On the Confederate right flank, Burnside finally moved forward. 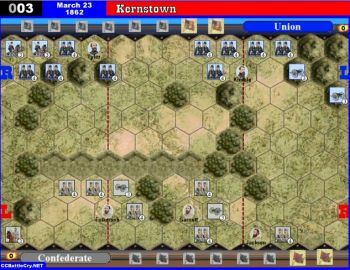 At the height of this crisis, Hill’s division arrived and crashed into Burnside’s formation and forced him to retreat. With Lee’s left and center sorely punished, McClellan had an opportunity to destroy Lee’s army. McClellan, despite having two fresh corps, chose not to attack further. The following day, Lee’s army remained in place, but McClellan was not inclined to renew the fighting, and Lee was able to withdraw his army across the Potomac. While seen as a Union victory, McClellan had failed to destroy Lee’s army. 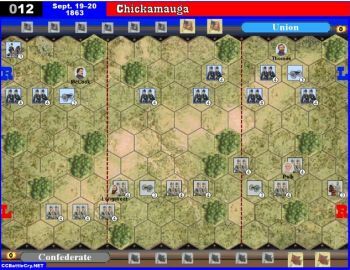 • The 3 fence tiles represent the sunken road. 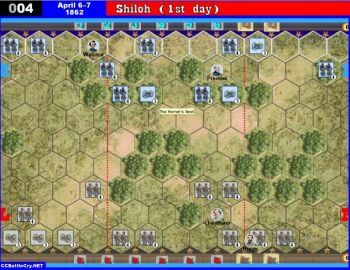 A unit battling an enemy unit on a fence hex reduces the number of battle dice rolled by 2 instead of 1. 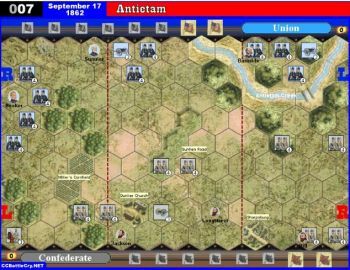 • Antietam Creek can be crossed only at the bridge. 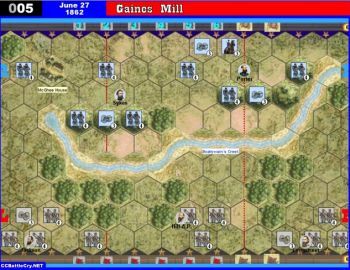 No units may move or retreat onto a river hex tile. Is the number of battle dice reduced by two for attacks from any direction, or is the terrain treated like a fence section for defense benefits? 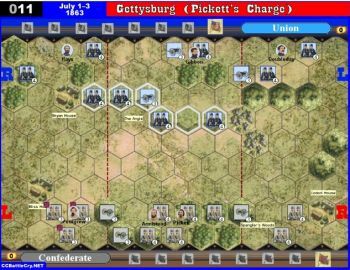 Treat the sunken road in Antietam (BC:150 p.23), like a fence line (see BC:150 p.10). An attacking unit in front of a sunken road (fence line) will have to reduce the number of battle dice rolled by 2. One of my favorite battles of all time! 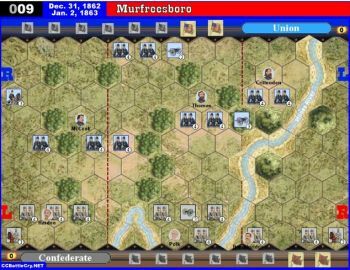 Lee fights the numerically superior McClellan to a stand-still on day one. 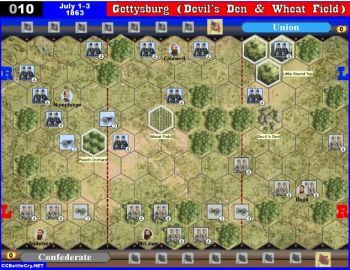 Dares McClellan to attack on day two. Then leaves the field of battle on his terms on day three. What more could you want in a battlefield storyline?